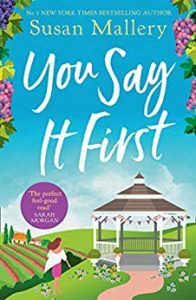 You Say It First by Susan Mallery is a delightful fun filled contemporary novel that focuses on love and weddings. Love is a complicated affair. There are some awkward family dynamics. “She’d been taught that love… had to be earned.” Love should be unconditional in a family but sometimes we try and try but never seem to be good enough. It may not be our ‘fault’ but the ‘fault’ of the person withholding the love due to their background.It is a heavy burden to carry. There is the question of belonging. Finding out that you are not who you thought you were produces tension within a family. Love may hurt. Love may fail but surely true love is a risk worth taking?